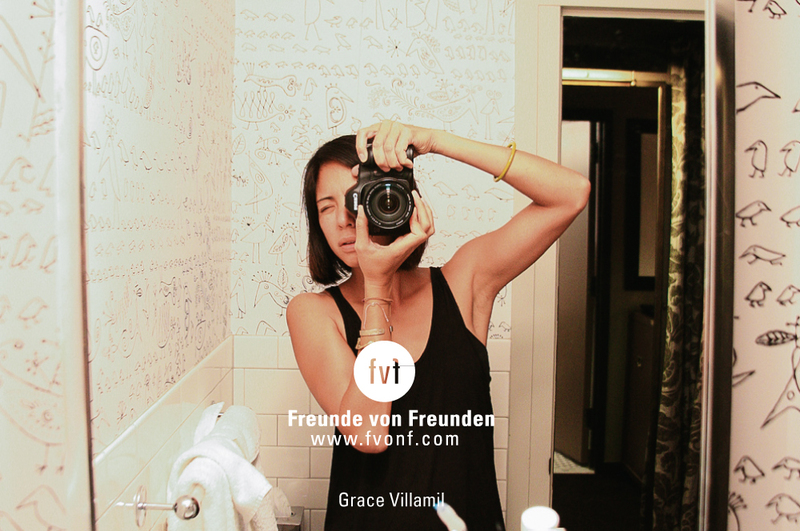 Today we are introducing to you one of our closest contributors from overseas: artist and photographer Grace Villamil from New York. She is not only a longtime friend, but was also crucial in making New York the second most featured city at Freunde von Freunden. With memorable portraits of local creatives such as set designer Johanna Burke, writer IO Tillet Wright or jewellery designer Johanna Methusalemsdottír, she leaves her personal imprint at our magazine and we love her for that. Exploring new landscapes – both geographically and culturally, dissolving boundaries and connecting worlds, she took on the role of our producer, liaison, supporter, go-to person, recruiter, interviewer, and international ambassador; paving the way for FvF’s international expansion and the ever-broadening network of global friends we have today. Grace dissolves perceived boundaries in everything that she does – whether climbing into the sky via Mount Roraima in Venezuela, driving across the States to catalogue places, faces and political races in the final days before the Obama victories (first in 2008 and then again for the 2012 election), or creating dreamy photographs in which subject, object and background dissolve into each other – Grace Villamil knows how to explore, cross and connect geographical, geological, cultural and natural landscapes to build new worlds. What’s essential to your daily routine? I start my day with a latté and a banana before grabbing my iPod and heading out into the sunshine. Very important. Also, silly surprise texts make my day. Where do you go to relax or get inspired? The ocean and the woods always bring me back to myself. To be honest, I don’t have to go that far to relax and get inspired. Tyondai and I live together in Brooklyn, in a sweet little creative bubble where we’re always inspiring each other with visuals and music, working on new ways to collaborate in the future. It has definitely made me more versatile. What is your best travel memory or destination? Canaima & Mount Roraima in Venezuela. Hiking to the top of an ancient geostructure from Pangea that is 3500 million years old is beyond articulation; hearing sounds rustling in from the fields; the enveloping greenness of dusk; the silent pink, yellow and blue sky; the roar of water from waterfalls ahead; the trees; and listening to the slight footsteps of my 5 beautiful friends plus 3 more beautiful Pemon Indians as we walk through the jungle. Control 11211, Moog Voyager, Zoom Field Mic, Ableton Live…I’m also experiencing the immensity of Sunn O))) live! What’s your preferred way to get around town? The JMZ; F; L; 4,5,6 trains, mostly, when the weather doesn’t let me ride my bike. The stacked and layered Dominican flags strung like bridges between neighbors’ windows across the streets; The family-owned Chinese takeout shops that still exist here (even though I don’t eat it, I like walking by and seeing their fried chicken with bright pink hot sauce packets); The fire hydrants rarely get shut off in the summer which delights the kids, not to mention the random bike or car owners benefiting from the shower; having sweet neighbors (in my case, I’m lucky enough to be living beside a wonderful brother and sister team who own a great restaurant on the corner, called Lighthouse); At 7pm-ish, relaxing with a beer at the local Argentinian joint after working long hours in the studio, then running out to see the intense orange sunset illuminating traffic on the BQE; Late night bike rides to McCarren soccer field to catch the end of a game, or if empty, to sprawl out in the middle. It turns into a silent fluorescent lit bubble. I guess you could say: the things that have stayed & the slow, subtle, beautiful transitions. Outdoors – I love nature and note-taking. Have a look at all portraits the creative lady shot for FvF here. In order to take a look at her 2012 cross-country tour of America pre-Obama victory for Periscope, a Japanese/New York-based magazine run by Yumiko Sakuma and gallerist, Yu Yamaguchi here.